German brand Rollei has revived its iconic Rolleiflex twin lens reflex lineup with the new Rolleiflex Instant Kamera. This model—Rollei’s first TLR camera in decades—retains the brand’s iconic look but adds modern features including support for Fuji Instax Mini film. The Instant Kamera joins a lineup first launched in 1927 with the original Rolleiflex prototype. The brand’s final TLR model, the Rolleiflex 2.8F, was released in 1960, “leaving only vintage cameras behind for true photography enthusiasts,” says Rollei. The company began exploring ways to revive the Rolleiflex line in 2017, ultimately launching the new Rolleiflex Instant Kamera on crowdfunding website Kickstarter. The reimagined Rolleiflex features the same twin lens system found on the models before it, but has been optimized for use with Fuji’s Instax Mini film. The Instant Kamera has a built-in electric flash, f/5.2 to f/22 aperture, a magnifier, manual focus (48cm to infinity), Multiple Exposure and Long Exposure modes, an ambient light meter, Fresnel anti-glare coated viewfinder, and a 3-element aspheric lens. Rollei slimmed the Instant Kamera down 30% compared to past twin lens cameras and added simplified buttons and knobs. Rollei is seeking funding on Kickstarter, where backers can get a Rolleiflex Instant Kamera by pledging at least HK$ 3,100 / $395 USD / €325 EUR. Shipping is offered globally, and expected to start for Kickstarter backers in October 2018. 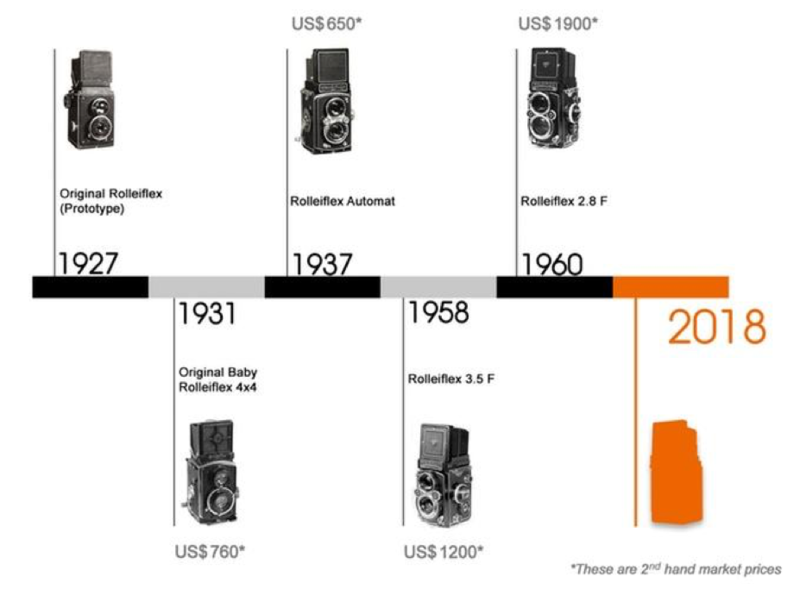 Rollei™, a well-known German brand, has over a hundred years worth of experience in camera and optics development. 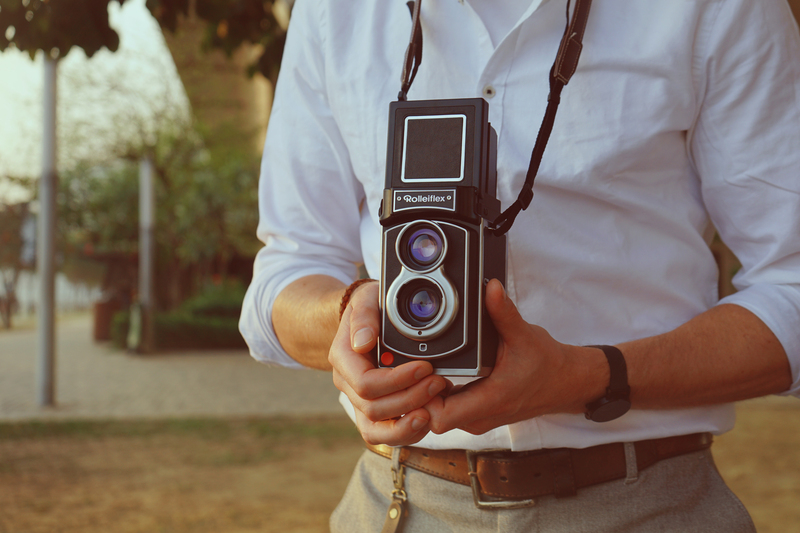 Rolleiflex™ is the name of our premier line dedicated to medium format twin lens reflex (TLR) cameras. The first Rolleiflex™ twin lens reflex camera came out in 1927. For the next few decades, we continued to innovate and push our development of TLRs until we reached our limit. The last Rolleiflex™ TLR update was released in the 1960s – leaving only vintage cameras behind for true photography enthusiasts. We have never forgotten TLR. So in 2017, we gathered camera enthusiasts, experienced technicians, TLR lovers and other camera manufacturers together in order to brainstorm new ideas for how to re-introduce the TLR for the modern era. In 2018, after 90 years old birthday of the first TLR, we’re proud to introduce you to the newest edition to the Rolleiflex TLR Camera. Over the years, we’ve received countless messages. And we developed a new idea and adding the twin lens element and classic design aesthetic in a way that meets the needs of today’s users. Rolleiflex™ Instant Kamera produces high quality images optimized for use with Fujifilm Instax Mini film. You will be amazed by the wide range of apertures from f/5.6 to f/22, accurate focusing from 48 cm to infinity with cinematic viewfinder and the built-in electric flash with automatic light emission control. This allows you to have a taste of instant photography with the well-loved twin lens system that Rolleiflex is known for. We hope to honor our legacy and let all of you enjoy the amazing visuals this camera will produce. Viewfinder Design: A Fresnel anti-glare coated viewfinder that is operated at waist-level allows you the perfect setup for street photography while on the move: shoot photos any time just by looking down. We’re confident that Rolleiflex™ Instant Kamera will evoke memories of days gone by when in the hands of people who grew up with one in the 60s. But we also want to introduce ourselves to a new generation of analog photographers to help them release their untapped creative potential. Box set includes: Rolleiflex™ Instant Kamera, lens cap, user manual, warranty guide, and 3 AA batteries.